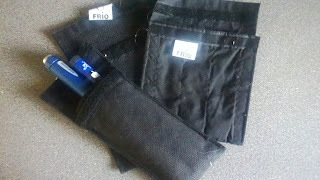 Now that summer has finally arrived I dug my Frio wallets out of my gear box to keep my daily use insulin pens cool. Insulin degrades at heat so it is important to keep it at a temperature where this doesn’t happen, and this is exactly what these do. 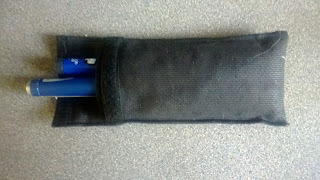 They come in a range of sizes to suit, I use the double pen wallet and the wide wallet for storage of spare cartridges. The Frio is a very effective and simple device, you simply drop the inner into water, and the gel pellets swell up retaining the liquid. In the heat the water evaporates and cools the contents using the principle of latent heat of evaporation. Simply, to turn water from liquid to vapour requires energy and that is taken from the contents of the wallet, the insulin and pen, and cools it down. Clever, simple and effective. The wallets are made from a black breathable fabric; breathable to allow the process to work, and black optimises the process by absorbing heat. So it’s best to carry these in an outside pocket, a mesh one is obviously best, if you have them. 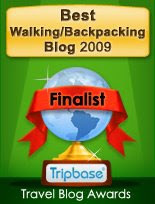 I’ve used these on my travels for over ten years now without a problem. The only downside I can think of is having my life sustaining drugs in an outside pocket which could make them vulnerable to breakage. However that is easily remedied by having a spare set carried by someone else, which is sensible at any time of the year – unless of course you’re going solo. I was toying with the idea of trying a pair of these for backpacking last year but for whatever reason I never got around to buying a pair. Fortunately for me I got sent a pair of Trail Gloves for review. Merrell Trail Gloves utilizes barefoot technology something that I’ve been intrigued about although from what I’ve read it is a matter of great debate in the runner world. 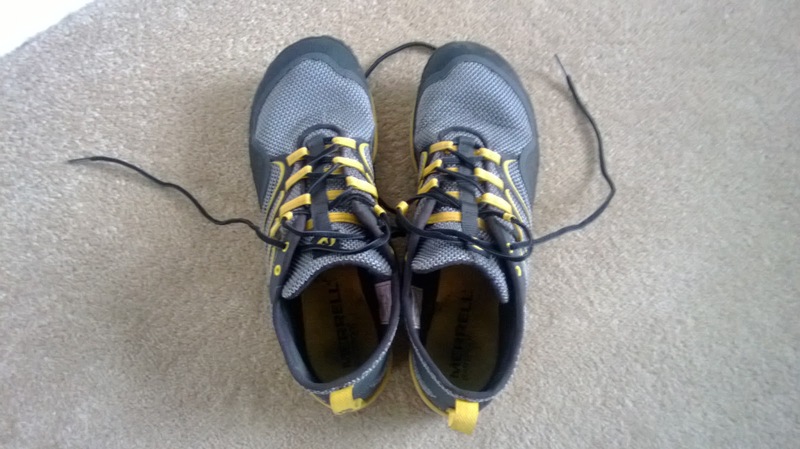 I usually wear Innov8 Terroc 330’s for walking and general use so in order to make the transition I wore the Trail Gloves on the walk in to work and home not a great distance but enough to start to see how they work. 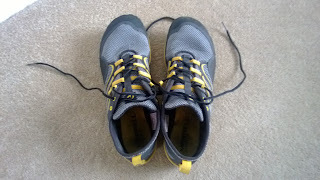 It was still fairly cool (and let’s face it we haven't had much of a summer) but my feet stayed comfortable with the mesh top apart from in the keenest of breezes but I’m used to that with the Terrocs. Despite a reservation about how thin the sole of the shoe might be, they coped with walking over the nobbled dropped kerbs at road crossing. And I went out of my way to find as many different surfaces as I could. 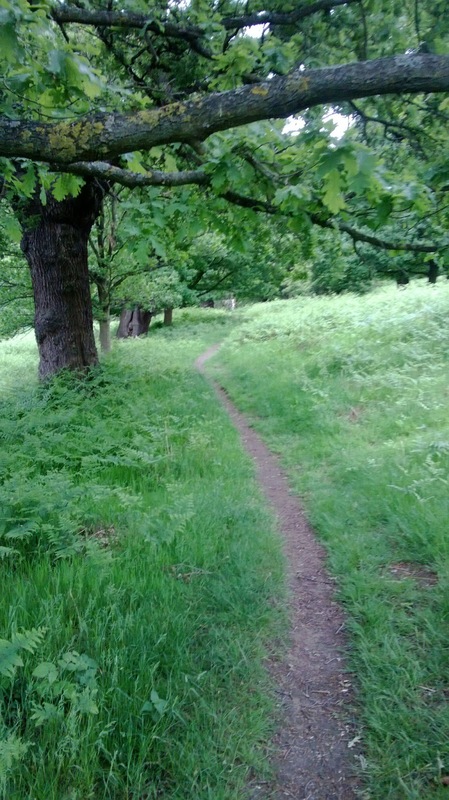 I then progressed to longer walks and short jogs. 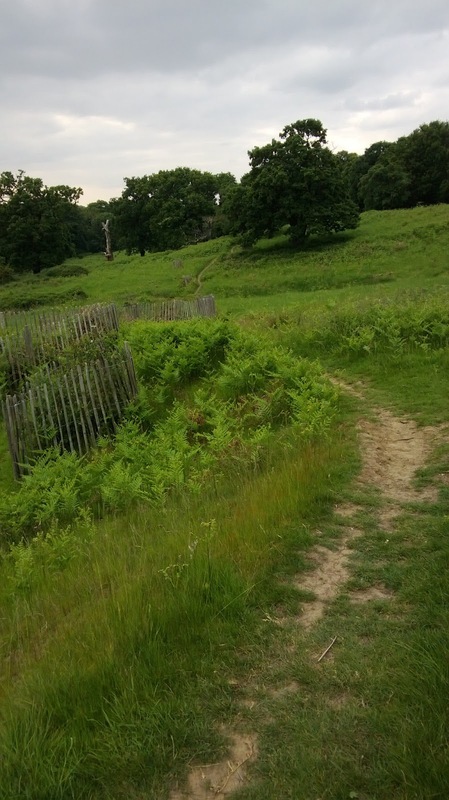 And it was the later that I found the most interesting my feet felt incredibly ‘free’ and I started getting a taste for running! This was something of a shock because I’d never really fancied the idea probably being put off by enforced cross-country runs whilst at school. I’m incredibly lucky living close to Richmond Park as that meant that I was able to make use of the park to run in but also pick a route that had climbs, descents, streams and logs to up in other words it was interesting and fun (and a bit like cross country but far removed from an urban north London ones I had earlier experienced). I was about to progress to using them on a backpacking trip when I suffer an injury to my knee, the left one which I pranged on the Pennine Way a little over a year ago. Not by running, walking, biking or climbing but by trying to fix a light. Stupid, stupid, stupid. I’m working hard with the treatment so that I can get back out running, and of course filling my Golite Peak with a few bits and pieces for gentle backpacking trip as I don’t want to overdo it too soon.